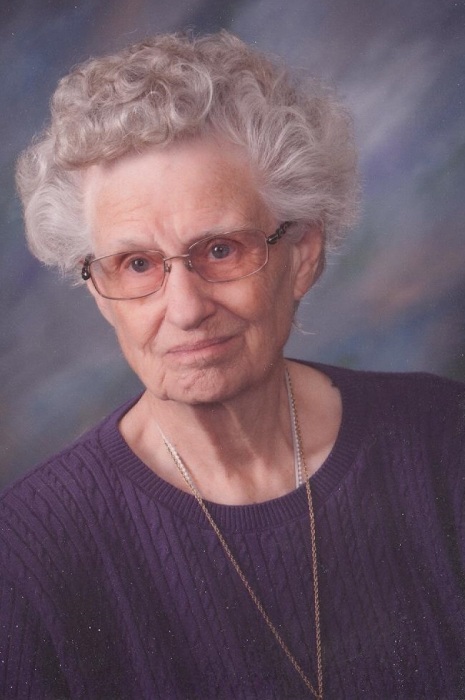 Longtime Sharon Springs, Kansas resident, Ruby Alice White, 96, passed away on Wednesday, October 3, 2018 in Stockton, Kansas. She was born in Dwight, Kansas on September 11, 1922 to Bird Ray and Anna (Jorgensen) Neff. She graduated from Alta Vista High School where she later taught school for 2 years. Ruby married Virgel E. White on March 31, 1946 in Alta Vista. He preceded her in death on June 2, 1987. After marriage, she moved to Sharon Springs, Kansas, where she lived for nearly 72 years. She was active in the United Methodist Church, where she taught a women’s bible class for over 24 years. She was also a member of the Rebekah Lodge and a 4-H leader. Ruby enjoyed gardening, sewing and was active in the Church. She came from a musical family and could be seen dancing whenever music was played. Most of all she loved her family. She was preceded in death by her husband, her parents, two brothers John and Ray Neff, one sister Opal Conaway and a great granddaughter Hayden Carpenter. Survivors include her sons Roger (Delores) White of Omaha, Nebraska, Terry (Janet) White of Olympia, Washington and a daughter Beverly (Tom) Carpenter of Stockton, Kansas. She is also survived by a brother Leslie Neff of Oklahoma City, Oklahoma, a sister-in-law Patricia Neff of Sharon Springs, Kansas, nine grandchildren and fifteen great grandchildren.